When avoiding dairy, it usually means avoiding most chocolate...which is considered a crime in some countries, so I'm told. I manage this situation by eating lots of dark chocolate, which is dairy-free. 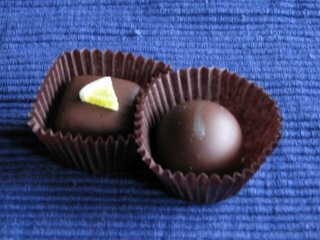 Chocolate is also a challenge for those with nut and soy allergies, as some flavored oils may have a nut base, or be made near nut oils. And lecithin, an emulsifier used in chocolate, is either egg- or soy-based. It also helps if you have a local chocolatier, like Compartes Chocolatier in Brentwood, because especially if you have allergies, it's easier to know what EXACTLY goes into everything. Jonathan, the chocolatier, is especially helpful and friendly. Compartes specializes in chocolate-dipped glaceed fruit, so for the dairy-challenged there are even more options. 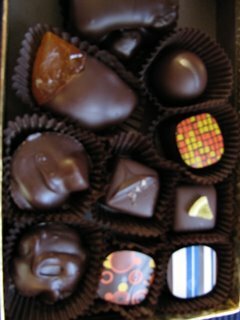 They offer beautiful, unusual combinations of chocolates. A bit sweet for my taste, but still lovely. Enjoy the pictures. Especially since I already ate all the chocolate.